The ever dependable Kirsten Kimono Tee pattern paired with a favorite, NEWLOOK 6192 skirt pattern, always pleases. Before I show you my new pieces, I experimented with my camera settings this morning. I use a Canon Rebel T3 camera that I've had for 5-6 years now. It was purchased when I was wanting to take better nature photos. It does not have wireless remote capability, so all my photos have to be self-timed which makes it tricky for the camera to know what to focus on. One of my goals for this year was to work on my overall photography skills, concentrating on 'light' as well as learn how to use the 'manual' mode successfully. Most, if not all my photos up until now, have been taken using one of the 'automatic' modes. In the photo below, the sun was not only behind me, but completely shielded by the house. The photo turned out with a sort of misty, moisty look, even though this was not a misty morning. Out in the sun now by the front island. The mid-morning sun is shining on my left side. The photo below left, was taken with the camera's 'automatic' mode. The photo below right, was taken on 'manual' mode with my controlling all the settings. Insert *big smile* here. :) There were plenty of outtakes of over exposed/under exposed that I won't bore you with.... but what a thrill to finally see improvement. Okay, let's talk about this cute outfit. Not much to say about the white knit Kirsten Kimono Tee as this is my 6th. The Kirsten Kimono Tee is a free download from MariaDenmark and is a hardworking basic in my wardrobe. Needing barely 1 yard of fabric, an hour or so of construction time and you have a great little top. This particular one was made with Wal-Mart's new line of cotton/spandex knit fabric, 60" wide at $5.98/yard. At first I didn't like the way it was sewing, but some of that frustration may be because my serger is not cooperating lately, so I'm serging with 3 threads, not 4. This top has serged seams with zig-zagged machine stitched hem. Cost $5.98. This NEWLOOK 6192 skirt pattern, view B (the bottom red one on the pattern jacket), is my all-time favorite pattern for an elastic-waist woven fabric skirt. I have even made one out of knit. Today's woven skirt is my 5th version from this pattern. This pattern does not include pockets, so I used the Ottobre pockets from no. 14 Pants. This pattern is so easy and simple, it only has 1 pattern piece for the front/back. My fabric is another purchase from Wal-Mart's new fabric line of 100% cotton, 43" wide at $4.98/yard. I only purchased 1 yard of fabric to make something else and sort of switched gears here. This pattern requires 1 1/2 yards, so I decided to make the amount of fabric I had 'work'..... and feel I've created a much better garment overall than if I'd had enough fabric to begin with. What I finally came up with: the casing for the 1" elastic is made out of a soft white knit.... the fashion fabric with a band of gray jersey knit (leftover from my Alabama Chanin 4-panel skirt) ... lined with 100% white cotton sewn in as an underlining, not as a traditional lining. The white knit casing does not bother me as no shirt will ever be tucked in. Also, the knit is soft against the skin, which is nice. I re-traced my pattern on the Pellon 830 Easy Pattern interfacing, cut off the band area based on the amount of fashion fabric I had, and added 1/4" seam allowance. I wear a size 10 with 1/4" seam allowances with this skirt. A peek at the bottom insides. I cut the white underlining off at the top of the gray knit band and sewed a small baby hem. I didn't want the knit to look 'stiff'. The knit hem was barely turned up and machine straight-stitched. The skirt runs on the short side. To construct the skirt with a traditional lining, or with an underlining, gave me some pondering moments ultimately deciding to go with the underlining because of the pockets. Thought it'd be easier to access the pockets if they weren't sandwiched between 2 layers of fabric. Seams are serged. Here you can see the modified Ottobre in-seam pocket pattern. Also, I did not (and do not) construct the waistband per the pattern instructions. I sew on the waistband casing provided and use 1" elastic and like the ample room in the casing. It makes for a comfortable 'fit' for me. This outfit completes my August 2015 Make a Garment a Month challenge, as both pieces are most definitely 'Awesomely Average'! oh yay! your manual mode photo is way superior! 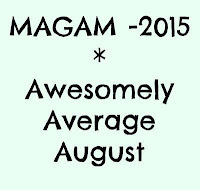 I love the phrase awesomely average! Your choice of grey fits so well with the main fabric, I thought it was the fabric border. It's a sweet skirt and the white Kirsten tee tops it perfectly. I'm wearing my culottes today with a contrast fabric for waist band too! I have not tried sewing jersey to woven fabric, but now that you have, I will definitely keep it in mind. Have a nice day, Lisa, it looks like summer is still staying around for a while! I'm impressed with your photography skills, great job Lisa! Also great job on that Outfit, the skirt looks great and I'm glad you didn't have enough fabric, I really like the fabric mix! A very pretty outfit, Lisa. I like the white knit casing. It sounds like a very comfortable idea and would prevent bulk around the waist. I have had the Kirsten pattern for months and have liked all of yours so I must make it myself. It might just be what I need to get started again. I have stalled since my holiday away. Another super cute outfit, Lisa! something at which you excel. They both look nice and pretty, and comfortable to wear too :) I like the last picture, of you rushing to get in the shot before the timer goes off! I must say, having the remote does make it a tonne easier. But if I use a timer I'm a lot more efficient, I think. I'm not sure which is better! I love pockets in skirts/dresses too. Yours look so good it's hard to believe that it was a quick and easy project. I'm finally home and able to enjoy this blog post more fully. I couldn't really see clearly on my portable gadget - I prefer the big screen. I love the way your style is evolving into simple, feminine garments that just work so well for your lifestyle. No point making clothes you won't wear. Must have taken you ages to do the photographs to get a handful that were just right. They are lovely though.